Just like you, our beautiful jewellery does need to be looked after. We have compiled a list of hints and tips for you on how to care for your Kathryn King Jewellery, so it will look as lovely as the day you received it. We have customers who continue to enjoy wearing their Kathryn King jewellery after owning it for 20 years! Remember you can bring in your Kathryn King Jewellery for a routine clean and check free of charge. Pearls and other organic or porous gemstones should be protected from the alcohol or acids in make-up, perfume and hairspray. Always put your jewellery on last, after your perfume has dried. Jewellery dips and sonic cleaners can damage pearls and gemstones, and wear down rhodium coatings. Generally, jewellery should be cleaned with nothing stronger than very mild soapy water and a soft toothbrush, while porous gemstones and pearls require only lukewarm water. There is no need to clean pearls – the natural oils on your skin will help maintain their lustre. Even very mild detergent may damage their delicate coating. 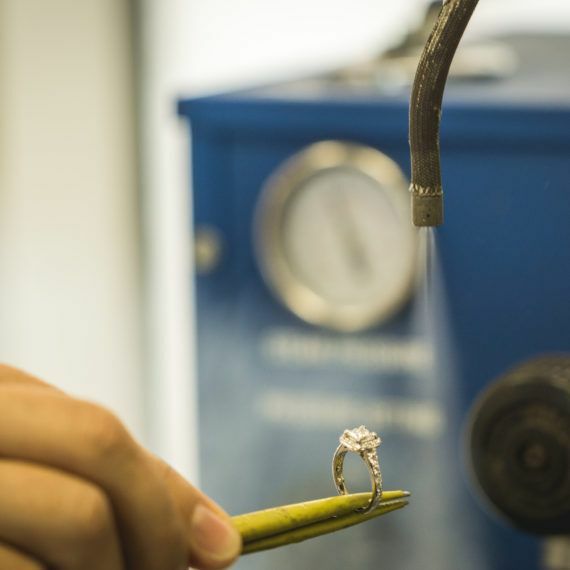 Some of our 18 carat white gold jewellery is plated with rhodium, which will give it a bright, polished white gold finish. Store your rhodium plated jewellery in its own pocket or pouch of a jewellery box or wallet to prevent it getting scratched and if your pieces start to look tired then bring it back to the shop for re-plating, to restore their shine. 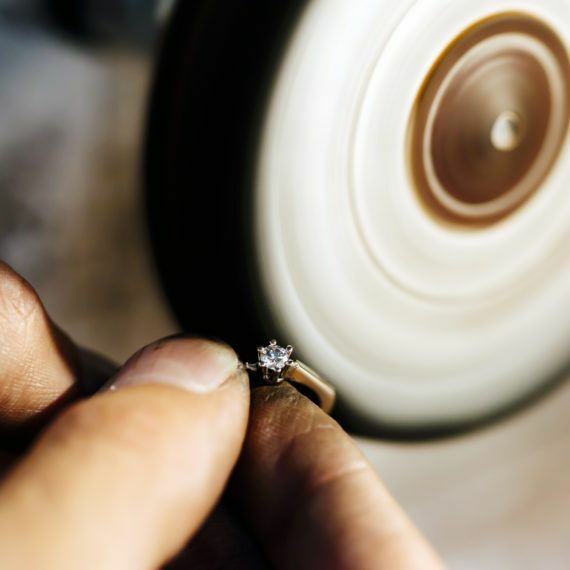 Although gemstones are some of the hardest natural materials in the world, the cut and setting can make them vulnerable. Larger stones in particular should be worn and stored with care. Porous gemstones, including amber, turquoise, opals and pearls may be stained by oils or liquids, so it’s particularly important to avoid contact with face creams, sun tan lotion and household chemicals. Wash porous gemstones in lukewarm water and polish with a lint-free soft cloth. Porous gemstones are more susceptible to damage when hot, so avoid wearing jewellery to the beach, where the sea salt, sun and sand could easily mar the appearance of your gems. Because the gemstones are set all the way around Eternity rings are susceptible to damage on all sides. The setting and the stones can both be damaged by sharp impacts that can occur when working with your hands, doing exercise etc. It is therefore best to wear your eternity rings on your non-leading hand and remove them if you know you are about to embark on an activity that may expose them to risk.